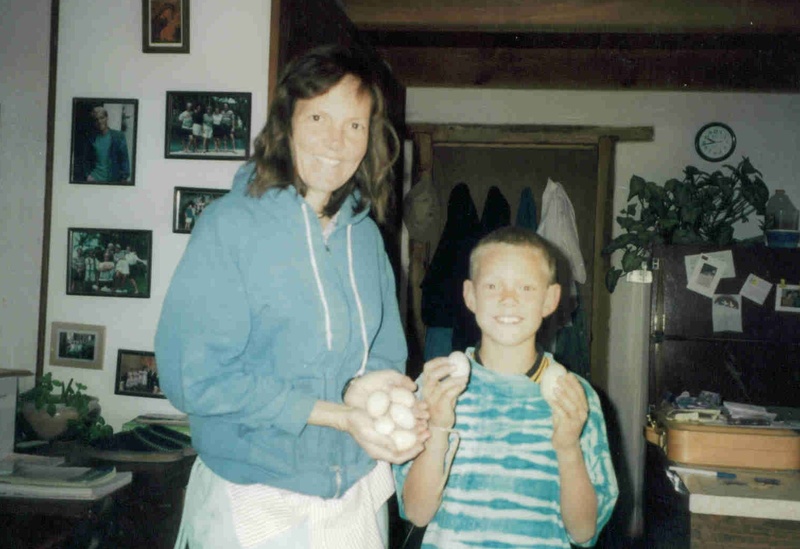 Mary Ann Halloran with her son, Joshua, holding up eggs gathered from the chickens. When I first came to this community I was 19 years old. I met Fr. Rick Thomas S.J. who would become a spiritual teacher to me in many ways. But besides that, Fr. Thomas had a sense of humor and a simple lifestyle. So I checked out a book named, “Chickens in your Backyard,” got a cardboard box ready for the chicks, and set a lamp on it to keep them warm. I also got an outside chicken pen ready for when they got a little older. One evening after that Fr. Thomas says, “Come on, let’s go get some baby chicks.” Off we drove a few miles away to this old small cinder block house, about 10 ft by 10 ft, where an old black man named Mr. Gregor lived. He was sitting there in his long underwear and his overalls. A lone light bulb hung from the ceiling and cute baby chicks were running around all around the floor. Mr. Gregor, in his raspy voice, says, “Go ahead and pick up your chicks.” So Father and I ran around after the chicks, picking them up and putting them in a box I had brought. Old Mr. Gregor sat on his army cot and watched us. It was very comical then and the whole scene still makes me laugh. We drove the peeping chicks back to the Ranch and placed them in the box I had prepared with the light. After that night, Fr. Thomas started calling me ‘Mary Hen’ instead of Mary Ann. Soon after that he changed it to ‘Mother Hen.’ The name stuck. Father gave me the name because I took care of the chickens. However, it proved to be prophetic and apt because later I became the mother of 8 children. And after Father Thomas died, I have taken on a motherly role in the community. Father Thomas called me Mother Hen until the day he died. It was a very rare occasion that he ever called me Mary Ann. I liked it, and I miss hearing it now. The story of you and father Thomas chasing chicks while Mr Gregor watched made me laugh, that is a funny story. I know you are like a spiritual mom to me and I’m very grateful for you. Thanks for sharing that story.